All our Youth Activities are aimed at challenging young people to expand their minds and abilities through age specific activities. All of our groups are led by appropriately trained and PVG approved leaders. We meet every Sunday during school term. Children of all ages are welcome. The children come with their parents or guardians for the Church service and after Time with the Young Church during Worship, they go to the Church Hall with the Sunday Club leaders to learn more about Jesus and the Christian life. 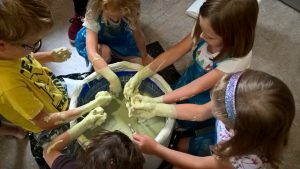 Messy Church is a form of church for children and families of all ages, whether they belong to the church or not, involving creativity, celebration, and hospitality. Each event includes a short celebration time involving : a bible story, prayer, song and games; a creative time to explore the theme of that day through getting messy; and a sit down meal together. We try to encourage people at all stages of their own faith journey by offering opportunities to learn about and celebrate God in our lives. 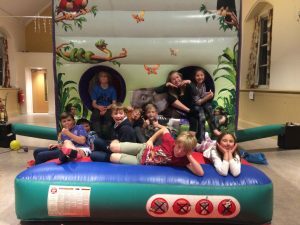 Our experience shows us that our Messy Church is great fun for all the family. 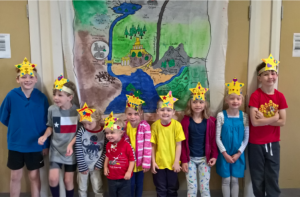 After visiting several local churches and learning from their experience, Comrie Parish Church started a Messy Church group in June 2018 and has held a further three events through the autumn. These are held in the Church Hall from 4.00-6.00pm on the third Friday of the month. The next gathering will be early in 2019. We hope to see you there. This year’s Summer Holiday Club was for all the family. Each day we looked at different heroes and villains from the bible and spent the morning in Messy Play. Each day a special Story Teller came to tell everyone about the hero or villain we were thinking about; whether it was David/Goliath, Daniel/Lion, Jonah/Whale, Noah/People, or Joseph/Brothers. 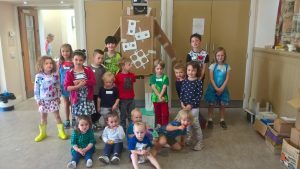 Dressed in an appropriate costume (including a lion), everyone listened well to the Story Teller before exploring the insides of a whale, or building a giant out of recyclables, or another activity which caused a real mess and resulted in great family fun. In this day of mobile telephones and computers, it was wonderful to see parents and children playing together in the safety of the church hall and grounds. With all the baking talent around it was a treat to be spoilt with having a freshly baked cake each morning. This was not just a treat for the children…but I’m sure many of the parents took an extra slice. And why not! Ignite Youngsters is a Youth Club for young people in P6 – S1, every Friday evening (except school holidays) in the Annexe from 6.30pm – 8.00pm. Activities vary each week but can include sports, crafts, cooking, baking, outdoor activities, themed nights and movie nights. Entry is £1 and youngsters can choose to bring extra money for tuck shop. Ignite is a teen drop-in for young people in S2 and older, meeting every Wednesday evening (except school holidays) from 6.30pm – 8.30pm, usually in the Annexe but locations can vary. Contact the Church for more information on 01764 679555. Activities vary and will sometimes simply provide a space for young people to congregate, and other weeks will be cooking, playing games, exploring faith or planning events.